RNZ's Maori Correspondent & former WHS student, Leigh-Marama McLachlan will now report out of Whanganui. There's a long list of reasons why Leigh-Marama McLachlan has moved to Whanganui but chief among them was the awa. "We have this saying in Whanganui where the river calls you home," she said. "There are times where people that I've lived with in Wellington have come back and they're saying 'the Awa's calling me back'. That's what happened to me ... my river called me home." 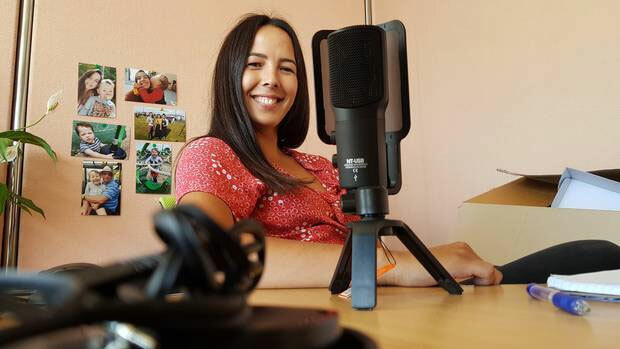 McLachlan, who grew up in Whanganui, is RNZ's Māori Correspondent and until now she'd been based in the public broadcaster's Wellington newsroom. But towards the end of 2018 she decided she wanted herself and her two young sons to move to Whanganui to be closer to her extended family. "I pitched it to work and I've been blown away at how supportive they've been in looking after me and making sure I get this opportunity," she said. "A big part of coming home has been my desire to raise my boys with their families and with their knowledge of who they are as Whanganui Māori ... they'll have access to a Kura Kaupapa here, the same type of schooling that I had, which is really important to me." She will be based at Nga Tai o te Awa Trust's innovation hub on Guyton St.
McLachlan said she had a wide network of friends and family in the city who would help her with her stories and if she needed support looking after her boys. Being in Whanganui would also help her do her job better, she said. "There are some big players in Te Ao Māori in Whanganui and I'll be sure to engage with Māori leaders in the community here for advice, their insights ... I'm related to a lot of them. It's a case of having a cup of tea and getting an idea for where things are at. "It will give me a greater and deeper understanding of what's going on instead of being based in a busy newsroom quite removed in the capital where a lot of our Māori aren't there." RNZ's head of news and digital, Glen Scanlon, said McLachlan would give them greater coverage in the region. "Leigh came to us with a proposal which we liked. [It] gives her an opportunity to be based in a community where she'll be really closely connected to the issues she has to cover. "She'll also be travelling a bit as well - she still has a national focus. It is part of what we hope to do more of in the future and that is have more people in more regional places and work more closely with regional communities." RNZ had a role to play in supporting regional reporting and the organisation was trying to be more flexible about where it based staff, Scanlon said. "I suppose if you look broadly across the country ... there has been a move away by some publishers from covering local issues ... so we do think we can help play a role there and we do think RNZ's mandate is for all of New Zealand, it's just not for main centres."